Welcome to the official discussion thread for Monster Party on the NES! To start, please add this game to your log, add it to your collection (if applicable), and (when you are ready) rate it using the link above! Awww, I clicked on this by accident..
Monster Party is a game that plagued me as a child; I broke new ground last night when I hit the 2nd stage, actually. Feels nice to play the game as a competent "adult." Knowing thats going on is very helpful. I wonder how many other games from yesteryear have been deemed "impossible" but are totally beatable? Anyway, has anyone else played this? NW Database says only four people have, but I know that Ploot has, so there may be more! Whats up, friends? I've been meaning to give the game my own playthrough but always balk about level 3. Game has all sorts of hit detection issues. Still fun though. Though I do remember spending the night at a friends house and he played the game in its entirety. That ending man. One of the scariest I ever saw at the time. I've beaten it before. Really weird game, but the sheer insanity of it is fun. Not only is the first stage (and some of the menus) some of the most gruesome stuff you'll find on an NES game, but the little mini-bosses that pepper the game are pretty memorable and completely bizarre. I agree with both of you guys on a lot. Very gruesome, though I showed it to Mrs_Mustache and she was unphased. "BUT THIS IS ON NINTENDO," I'd say. Nothin'. Kids these days.. (alright, before I'm called a cradle robber or something, she's like 27). I like that they don't repeat mini-bosses at all. Pretty neat. This is a game that SCREAMS palette swapability. I did encounter some pretty cool stuff though, in addition to levels I've never seen. Having played Okami, I'd grown accustomed to the scary wells with spirits around it, and there IS one in this game! I thought that was neat! --Chris, what is giving you trouble on 3? I think I 'breezed' through it last night. Not sure how long the whole playthrough took me. Less than 3 hours (due to deaths)? I dunno exactly I just kind of stop playing at around that point. That may not look like much now but in the eyes of a 7-8 year old, that was intense. I landed the final blow by slugging an eye back at him. HOMERUN, BABY! And yes, that ending was like "WHAT?!" I said "please don't make me play through this game again.."
And now I just beat the game. Felt pretty good to get that one done as well. Usually when I play I'll die at some point and just feel all "meh" and turn it off but this time I persevered. 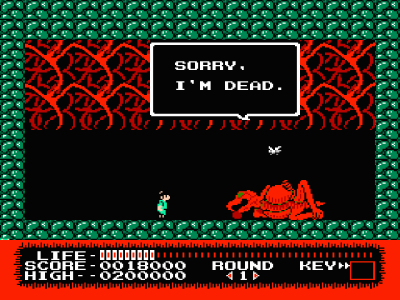 Even after I died just before the end of the first level. Just did it all over again a bit smarter and didn't die after that though I got damned close at the last boss. Just couldn't hit him in the nose with those flying eyeballs. I have updated my Monster Party ownership in the database and gave it a score. It would be a forgettable game if not for the presentation. Fighting off a giant, floating onion ring (fried shrimp ring?) is just too good. I think I'll play through it again tomorrow as a Halloween treat to myself. The maze level is the worst though. After my Bert wore off, I just put myself in the corner and wailed away. One of 'em went yard, and that was enough.